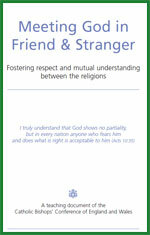 The Bishops of England and Wales launched a book "Meeting God in Friend and Stranger". 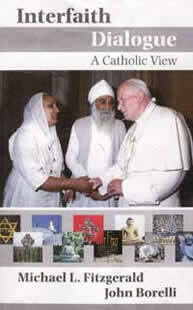 The document is a guide for Catholics to interreligious relations. Rev. Mariadass, St. Teresa of the Infant Jesus, Heaton Road, Newcastle upon Tyne NE6 5HN. There are currently no courses planned. They will be displayed here as announced. The United Hebrew Congregation of Newcastle would like to invite you to share in our commemorative event taking place on Wednesday 1 May from 7.00pm in the Marion Abrahams Hall at the Synagogue, Graham Park Road, Gosforth, NE3 4BH. The guest speaker is our Vice President Gerald Stern who will be sharing his father Freddie’s experiences escaping from Germany. A double-sided flyer is now available to share. Please find attached the Pontifical Council’s message for Mahavir Jayanti which, this year, falls on 17th April. It is a festival marked by the Jain community, which is quite small in numbers in England and Wales, so might not have come to your attention. You might remember Cardinal Tauran’s visit to the Oshwal community, one of the largest branches of Jainism in the UK, here are some images from that visit. Jainism is a Dharmic religion – the cycle of death and re-birth is at the centre of its beliefs, and non-violence is a central value, to the extent that some Jains monks and nuns will sweep the ground before their feet, and wear a face mask, to avoid disturbing or hurting even the smallest forms of life. As in all religions, there is a great breadth of practice and belief, but many Jains will, in addition to meat, eggs, and sometimes dairy, avoid the consumption of root vegetables, again in the name of protecting life. Mahavir Jayanti (the feast day dedicated to Mahavir), or, more formally, Mahavir Janma Kalyanak Diwas, commemorates the birth and the life of the 24th thirtankara (teacher, literally: ford maker – someone who creates a path to salvation) of the Jain religion, and final one for the present era. Born around 600 BC into a noble family, Mahavir renounced his wealth and status when he turned 30. Stories about this period of his life centre on his compassion and calm in the face of persecution and adversity. Mahavir is often depicted with a cobra – a beast he tamed by meditation and compassion alone, bringing it to the realisation of its own destructive anger. After twelve years, he is said to have reached enlightenment, and continued to travel and teach the Jain religions for another three decades. Suggested bidding prayers for around the time of the festival and now available also containing more details on the festival itself, and the Jain faith. Please read the press release from Bishop's Conference referring to a meeting of Catholics who came together to celebrate the dialogue work with other religions, and with other Christians – using the special relationship Catholicism has with Judaism as a bridge between the two, held on Tuesday 26 March 2019 and hosted by Bishop Patrick McKinney. 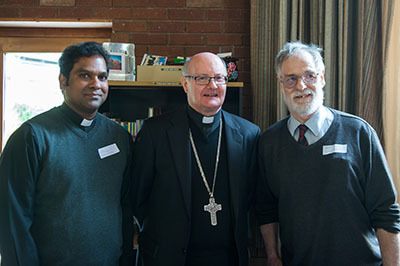 Image courtesy of Mazur / catholicnews.org.uk (l - r) Fr. Mariadass, Bishop McKinney and Graham Wilkins. In a series of tweets, Bishop Patrick McKinney, who holds the interreligious brief, urged people to prayer “please join me in praying for those killed in the two Christchurch New Zealand mosques. May they share in God’s eternal love. It underlines just how important interreligious dialogue is for peace and social cohesion”. He also said he was “saddened by the horrific attacks” and that he was saying “prayers of solidarity on behalf of the Catholic community here in Nottingham”. Finally, he shared the following video of Dr Musharraf Hussain, CEO and Chief Imam at Karimia Institute, Nottingham, urging people to listen to his wisdom: https://youtu.be/Etq-jbMCa6Q. In his speech, Imam Hussain urges his listeners to “seek help through patience and praying”, to remember that the victims of the attack have eternal life with God, and that the Qur’an presents the other not as someone to be suspicious of or to be despised, but as someone who has to be recognised, by seeing difference as an opportunity to get to know each other. There is a useful roundup of Christian reactions here, too: https://www.premier.org.uk/News/UK/New-Zealand-mosque-shooting-how-the-Church-responded. The Newcastle Council of Faiths have released this statement following the recent attacks that took place in Christchurch, New Zealand. There are some interesting items in the February issue of the Westminster Interfaith Newsletter. Available to read or download now. In the presence of Rt. Rev. Séamus Cunningham, Gabriele Keenaghan told the story of her flight from the Nazis on the Kindertransport. Photographs from the evening are available on our Holocaust Memorial page. There are some interesting items in the December issue of the Westminster Interfaith Newsletter. Available to read or download now. The Pontifical Council for Interreligious Dialogue at the Vatican has shared a message for this Sikh festival. The full message is available to read or download now. This feast marks an important Sikh festival that celebrates the life and mission of the first teacher (guru) of Sikhism. We wish our Sikh neighbours, friends or family a "Happy Guru Nanak Jayanti". The Catholic Bishop's Conference of England and Wales has produced a small leaflet of bidding prayers for non-Christian religions on their major festivals. This is available to download now. The Pontifical Council for Interreligious Dialogue at the Vatican has shared a message for this Hindu Feast. The full message is available to read or download now. The annual Diocesan Christian / Muslim Women`s event to pray for peace took place at the ruined chapel to Our Lady, Jesmond on Saturday 30 June 2018. Read more about it here. 2017's report and pictures are still available. In the presence of Rt. Rev. Séamus Cunningham, Mr Simon Wallfisch told the story of his Grandmother, Anita Lasker-Wallfisch, a survivor of Auschwitz and Belsen. Photographs and video from the evening are available on our Holocaust Memorial page. The 2017 Interfaith Peace Pilgrimage took place on Saturday 21 October. Organised by the Diocese of Hexham and Newcastle in association with the Crookham Peace Centre. See the full report and pictures from the 'Ashes to Go 2016' event in Sunderland. See photos of the Hexham and Newcastle Diocese Holocaust Memorial Evening 2016. Interfaith Cricket Match and Family Fun Day - August Bank Holiday. 'Chain of Peace' Peace Initiative in Newcastle July 2015 See photos and report. See report of the Joint Christian/Muslim Women`s Event May 2015. See photos and report of the Hexham and Newcastle Diocese Holocaust Memorial Evening 2015.